These lines serve downtown and neighborhoods in the western and southeastern parts of San Francisco. The N and T lines both stop at AT&T Park. In downtown San Francisco, the Muni Metro light rail runs underground and in the neighborhoods, trains run at street level. The above-ground Muni Metro stops platforms are in the middle of the street, while the underground stations are adjacent to the BART stops along Market Street. The Civic Center, Powell, Montgomery and Embarcadero stops share a station with BART. When you purchase a ticket at these stations, make sure to use the Muni Metro vending machines and not the BART ticket machines. Portions of the J, K, L, M and N lines run on the street. The Muni Metro stations from West Portal to The embarcadero are underground. 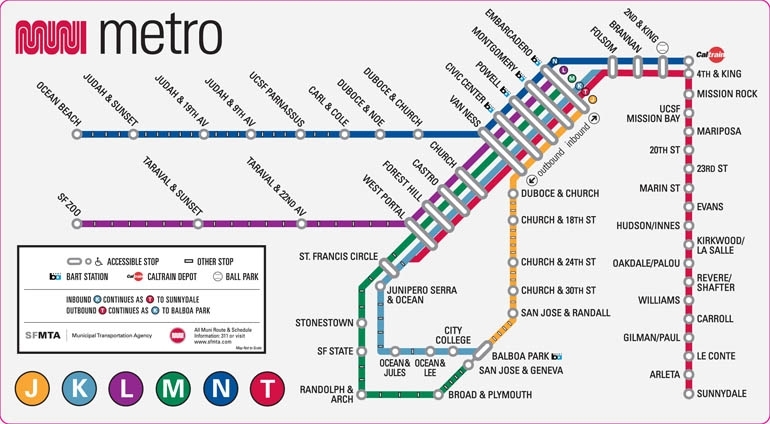 The downtown subway stations (between Civic Center and The embarcadero) are shared by Muni and the Bay Area Rapid Transit District (BART). These stations are multi-level, including a concourse level, a Muni boarding platform at mid-level and a BART platform at the lowest level. A single ride fare on Muni is good for 90 minutes of travel, whether it be on a single route or a trip with multiple transfers across buses and light rail.